Aroma has a lot of white wine similarities, green apples, and nicely dried out yeast. Mouth feel is average and the carbonation good. 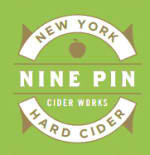 Flavor brings out nice fresh apples, dry white wine yeast, and an incredible crisp drinkability. The use of the white wine yeast was no disappointment as this was fully fermented and the high abv gives it a nice kick.